Editor's note: Our guest blogger today is Duncan Ford, CTO at CAN Telematics in Calgary, Alberta, Canada. 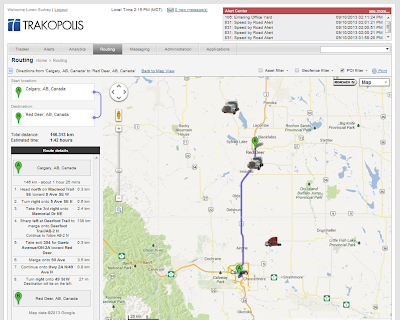 CAN Telematics provides Mobile Resource Management solutions to a range of industries—notably, the oil and gas industry concentrated in western Canada. See what other organizations that have gone Google have to say and learn more about how Google Maps for Business can help businesses in the transportation industry. Oil and gas companies face an unusual set of challenges in their everyday operations as a result of having a lot of equipment, assets and people spread throughout a large territory. These companies need to track the location and status of all their drill rigs, pipelines, trucks, crews and other assets. Our company, CAN Telematics, helps oil and gas companies address these challenges with solutions that track their assets, operating status, maintenance history, financial information and more. For example, one device monitors a well pump or a generator to sense the presence of certain gases or poll for other engine data. Another, mounted in a truck, logs location, speed, acceleration and braking habits. A third provides an “SOS” button for remote workers. Some devices incorporate accelerometers to detect falls or lack of movement. 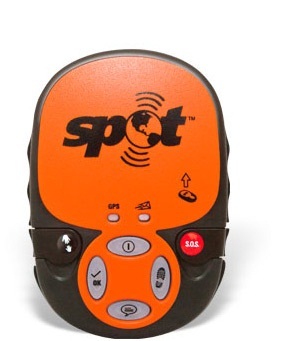 The data is collected by GPS-equipped monitoring and sensing devices, then stored in the cloud. Our solution is based on Google Maps and retrieves data from Google Maps Engine, offering a familiar interface for our users as well as huge scalability. We also save our customers time and money by making information more accessible, and immediately meaningful. This video about Trakopolis shows how the sensing devices and maps work together to help companies track their assets and related data. The benefits to companies are significant, starting with cost savings. They can add their privately built roads to the public roads in Google Maps, so it’s easier for them to determine which truck is closest to a facility that needs assistance. 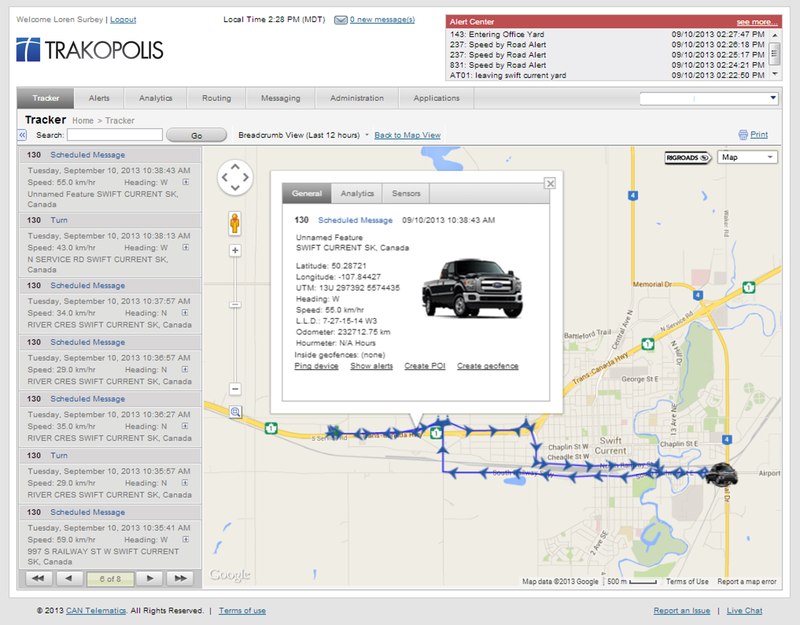 The maps also enable more efficient routing, saving time and fuel. These companies can also earn rebates on fuel taxes by easily determining the portion of their trucks’ travel that occurs on private roads -- with a fraction of the tedious, error-prone, manual record-keeping effort formerly required. Driver’s history plotted on Can Telematics’ Trakopolis map interface. Dispatchers can enable Geofencing capabilities to receive alerts when certain assets enter or leave an area. Even more savings can come from tracking average speeds and driving habits: once monitoring begins, truck drivers tend to slow down and drive more carefully, so there’s a big safety benefit along with fuel and vehicle maintenance savings. Our overall goal is an easier, more efficient and cost-effective way for far-flung companies to keep track of their extremely valuable assets. As we deploy our solutions to other continents and other industries, Google Maps is the natural choice for delivering critical information to the people who need it.